Studies have shown that businesses risk failure if they are unable to reopen quickly after a disaster. 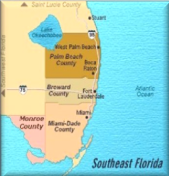 To reduce these risks and improve communications within the business community, Florida International University (FIU) has developed the Business Continuity Information Network (BCIN, pronounced “bee-kin”) a web-based service where local businesses, county emergency management, and organizations that assist businesses can gather to share critical information and support continuity efforts before, during and after a disaster. Available year round as a public service, this trusted, business-to-business, community network provides participating companies a tool to track their key employees and supply chain status, and locate needed recovery goods and services. If you are new to the BCIN community please take a moment to review the pages linked above to learn more about the BCIN tool and why FIU and its partners are committed to improving the ways business communities recover from disaster. In the county of West Palm Beach exercise, we demonstrate the system to WPB Dept. of Emergency Management and companies. In Miami-Dade company exercises, over 50 company attendees are operating our systems for a training exercise. Evaluation is conducted during the exercise and the feedback is good. In Miami-Dade Dept. of Emergency Management’s Statewide Hurricane Exercise, our systems are responsible for disseminating and responding to injects during the course of the exercise used by both government and company users. Business Continuity Information Network Briefing took place in Houston, TX and was hosted by Harris County Emergency Management and FEMA’s Private Sector Office. The meeting was attended by local business community and government agencies including Chevron, Home Depot, Valero, HEB, Entergy, Hotel and Lodging Assoc., City of Houston, and many others. It provides a unique and first-of-its-kind forum for business and government agencies to discuss cooperation, collaboration, and information sharing. “Storm Warning” (Part 1, Part 2) discusses the motivation and approach for the Business Continuity Information Network (BCIN) system. 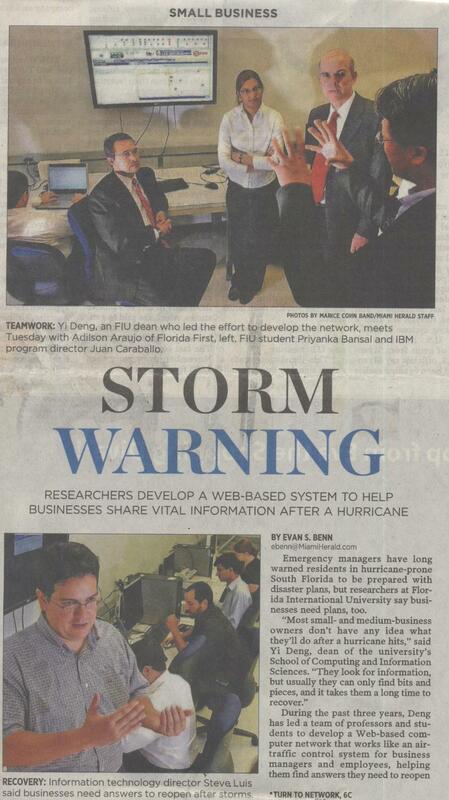 BCIN is being developed by the School of Computer and Information Sciences at FIU to provide small and medium businesses with the information they need to recover quickly from a storm. “Business owners need to know when their lights are going to come on…they need to know that barrier islands are being evacuated….” and they need this information in real-time. BCIN is being developed in South Florida among a growing group of participants so that vital information for small business is only a few clicks away. As the system matures, BCIN will develop into a nationwide web-based recovery system.